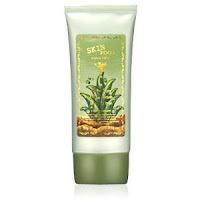 A Triple-Function Cream containing Aloe and Mushroom extracts that hydrate the skin. Its active ingredients, arbutin and adenosine, help improving your skin tone with their firming effects. And it blocks the sun's UV rays that darken and age your skin. Use: Take out a small amount on the back of the hand and use your fingers to pat and spread the cream on the cheeks, nose, chin and forehead. This multi-functional BB cream combining skin-care and make-up protects your skin from darkening and UV rays, a main factor of aging. 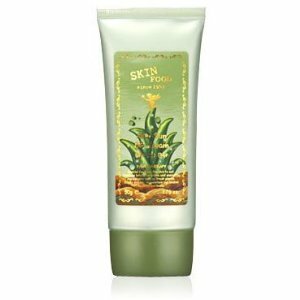 Rich with aloe, which excellently soothes skin and provides moisture, this cream leaves your skin feeling moisturized and naturally corrects your skin tone to ensure clear and bright skin tone feeling like your own skin. Use: Take it onto the back of your hand. Use your fingers to apply it to the cheeks, nose, chin, and forehead in order. Pat and spread it over the whole face. Reviews: This feels like a watery version of the mushroom one. It still moisturizes really well. Its courage is light-medium yet very buildable, unlike the mushroom one, more than one layer might already be too much. I use it overall once for the entire face, then go back and dab more onto my dark circles and the bridge of my nose as a highlight. It does nothing covering my freckles tho. It has a fresh clean sweet smell which i dig lol. Comparison: At first I really wanted to do a comparison but now its kinda impossible after stating all the pros and cons for each one. They are completely different. 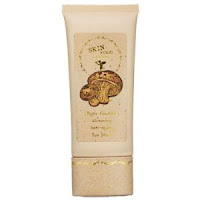 I personally love the mushroom one a lot more for the amount needed and its firming effect. Its totally worth that extra $15. But for you pretty girls out there who only want to brighten up your skin and have a multi functional product (base + concealer + highlight) and dont have much to conceal, the aloe one isnt a bad choice. I used to be a huge tinted moisturizer fan but both of these are still better than any tinted moisturizers. I am not sure if they would be too thick when the weather picks up more but as for now it works really well with my skin. I loooove aloe, I have loads of products like that, works good hmm?? is time to be happy. I've read this post and if I could I want to suggest you few interesting things or suggestions. Maybe you could write next articles referring to this article. I want to read even more things about it! coverage! Keep up the wonderful works guys I've included you guys to my blogroll. Li Yuan was very sad, and each reference must be tears. And suddenly, people looked to the king for a performance that would emotionally connect. to beat compare to other races. Finding affordable recycled home furniture is cost effective and great for the environment. To develop a Joomla site it requires expertise in PHP. offer, therefore creating your own custom Joomla template may be a better choice. host has set a specific port to connect on (21 is default). talking with me. A superb quality-wrestling shoe will normally last a year or two. Cody Rhodes or John Cena (both extents) then your chances are even slimmer. Hi there would you miund sharing which blog platform you're using? then mopst blogs and I'm looking for something unique. through it aall at the minute but I have saved it aand also added your RSS feeds, so when I have time I will be back to read a great deal more, Please do keep uup the excellent work.